USAG Bavaria American Red Cross volunteer Meagan Elam works with community partners for the 2016 Escape the Outbreak event. 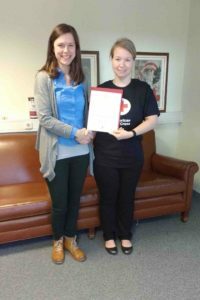 Regional American Red Cross awarded two volunteers at USAG Bavaria the Volunteer of the Quarter for the last two consecutive quarters. The Red Cross Office at Vilseck has a record for empowering strong volunteers to do amazing things for the community in support of this mission, with two consecutive wins for Volunteer of the Quarter in their region. Meagan Elam was voted Volunteer of the Quarter for the Stuttgart Region of the American Red Cross for the period of July to September 2016. Meagan is the disaster action team leader, and in this role, she planned our post-wide disaster preparedness event called “Escape the Outbreak” in September 2016. The Red Cross partnered with 12 organizations on post, had 19 teams, a total of 94 participants and 31 Red Cross volunteers working the stations. Red Cross Field Office Coordinator Kelly Clark awards Meghan Huff region’s Volunteer of the Quarter. The Red Cross Office at Vilseck has a record for empowering strong volunteers to do amazing things for the community in support of this mission, with two consecutive wins for Volunteer of the Quarter in their region. This event supported the mission of the American Red Cross by preparing the community to deal with any disaster that they may encounter. Each station was designed to educate the participants on how to deal with different disasters that they may need to respond to in the future. Meghan Huff was voted Volunteer of the Quarter for the period of October to December 2016. Her work as clinic lead has led to the placement of several nurses as volunteers in the Vilseck and Grafenwoehr Health Clinics. While this task may sound simple, it is often a long process to place volunteers into the clinics due to rigorous background checks and regulations. In her role as clinic lead, Meghan has helped liaise between the volunteers and the clinics and provided valuable volunteer opportunities. Meghan’s position directly relates to the American Red Cross mission as she ensures that our community’s medical professionals are able to maintain their skills through volunteering, allowing them to help in the face of emergencies with competence and confidence. She has worked with community partners, volunteers and key garrison members to ensure that volunteers are properly placed within the clinics. It is only through the contributions of donors and volunteers that the American Red Cross is able to carry out its mission to help alleviate human suffering in the face of emergencies. To learn more about the American Red Cross and how to volunteer please call DSN 476-1760, CIV 09662-83-1760.